In one word, this city is just stunning.. I would recommend that this deserves 2-3 days itinerary. 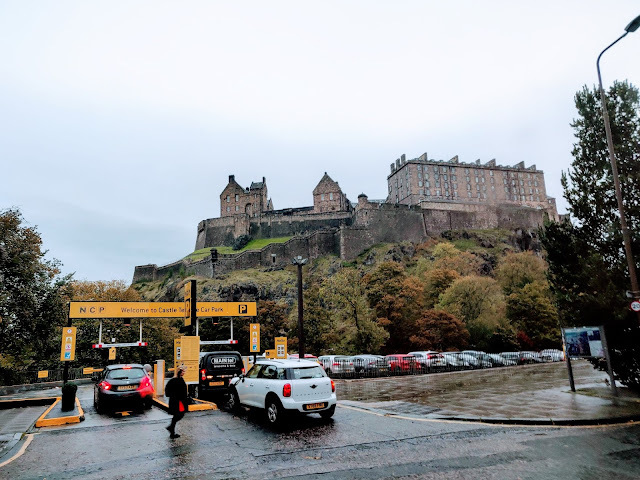 During our Scotland trip, we were too excited by Isle of Skye, Glencoe, Ben Nevis and so much more that we almost couldn't allocate any time in this beautiful city of Scotland. We landed in the night and our trip for Isle of Skye was to start in the morning. So we decided to tread here at midnight and early hours of sun-rise. This is a huge castle sitting in the middle of the city center. 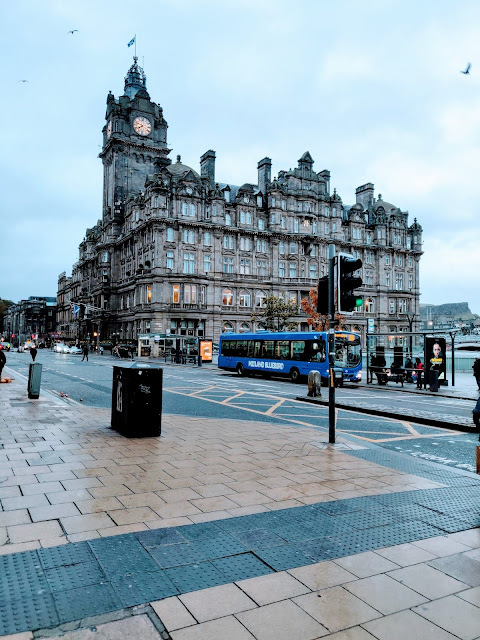 It is a short walk from the City Center station - the City Center is also known the Edinburgh Waverley station. It was decorated in purple night lights and we observed a lot of ghost tours operating at this hour. There were guides dressed as vampires or witches and they were talking to people about the history of the city, the castle and the places around the royal mile. This castle sits on top of an extinct volcano. You can view an entire city from this place and as history tell us, this is the most attacked castle in the whole world. This castle is Scotland's most visited Paid attraction with over 1.5 million visitors every year. This is also reputed as one of the most haunted spots in Scotland, the name of the ghost is Lone Piper. We really enjoyed our walk around the Castle. The wind was chilly especially as you start climbing up towards the castle but it looked absolutely beautiful. Ticket is only needed if you go inside to explore this castle - we went at mid night so obviously was closed. This is an old street which runs in the magnificant old town to Edinburgh - starts from the Castle on side and ends at the shadow of Aurthur's seat. This road is kind of special as it has narrow alleys and staircases going all over the place landing people somewhere. Be careful not to get lost in these small staircases. There are markets, pubs, Scottish breweries and much more on the way. As you walk along there are plenty of attractions on the way - Scotish Whisky experience, St. Giles Cathedral, The Scotland Parliament, The Palace of Hoodyroodhouse, along with a lot of cafe's and food joints. This church dates back to 14th century and is a category A listed building. This has been a prominent place of worship for Church of Scotland. It is beautiful and you will spot this while walking on the royal mile. The visit is free of cost and there is no entrance fees. Very impressive building from the middle ages and a short walk from the St. Giles cathedral. We couldn't go as it was very late in the night and there was security. But you can book guided tours and visit the parliament on any of the weekdays, it is open to public and I have heard really superb things about it. Edinburgh is divided into 2 parts, the Old Town and the new Town, intertwining each other. The Castle, Royal mile and Parliament etc. are in the Old Town side while a short walk from there leads you to Princess Street which will start blending the old and the new town styles. Look around at the buildings, architecture and colorful gardens on your sides on the Princess street. We were staying in a hotel on Princess street, so we took a walk here around the morning dawn hours. 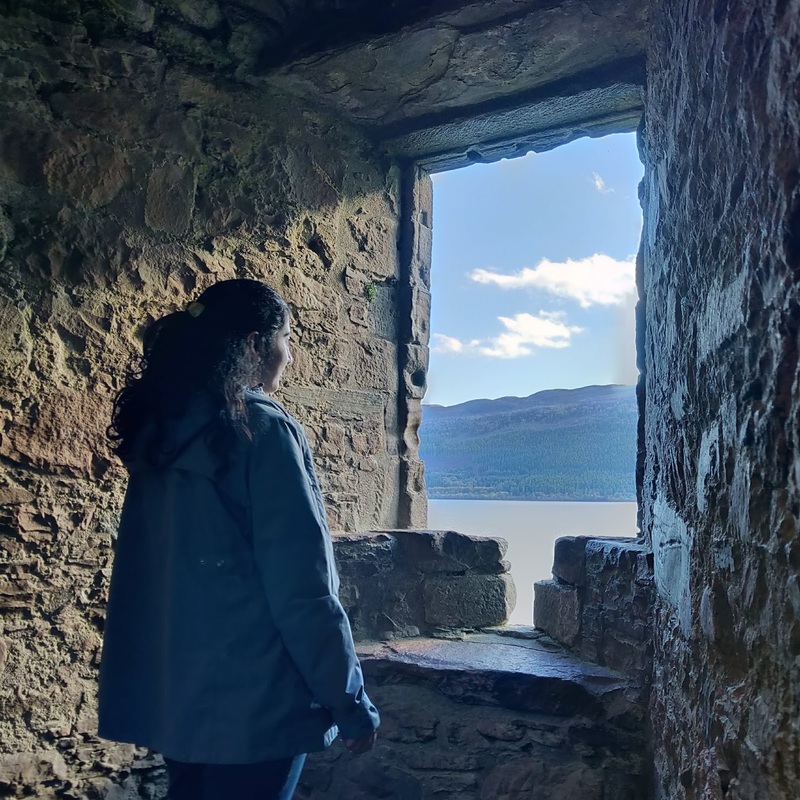 There are many other places you can visit in the city such as National Museum of Scotland, trek to Aurthur's seat, Camera Obscura and many more. We were on a budget holiday, however we do not like to compromise on the hotel rooms. We also like to stay closer to the city center as it allows us to walk around and experience the culture of the place. So we found the perfect place which was indeed a money saver. We stayed in Travelodge Hotel on Princess Street. The charges were around 35-40 GBP per night for a family room. They said that they did not have a restaurant and room service etc. hence it was the basic price. The room was very spacious and superb (even better than the hotels that we stayed in London and paid more than 150 GBP per night). For food, this is located on the central Princess Street, so lots of options around. There is a Mc.Donalds just outside. This place was a 10 mins walk from the Edinburgh central station. Be careful there are many Travelodges in Edinburgh, we ended up on the one on Queens street (poor me lost on google maps). And then had to walk all the way back to Princess street. **This is not a promotion - i stayed there and paid from my pocket. There are also a lot of AirBnb options available which are very pocket friendly and can be explored if you are staying for a couple of nights. The cabs are expensive - try to take Uber wherever possible as atleast it shows the estimated price of the trip before you book. The city is very much covered on foot, so avoid cabs - almost all the attractions can be covered by walking. Lots and lots of options. The cafe's and shops along the Royal mile are slighly overpriced, so i recommend you go in the interior lanes and try the local Scottish cuisines. We love Indian food, so we went to this place called "Roti" - food was good and was reasonably priced. It is just a short walk from the Princess street on the South Bridge. Directions on google. Safety at Midnight : I think the city was pretty safe, if you go on the main roads and the Royal mile. There are lot of mid-night walking tours available, so you do see people exploring the city in night. However, its better to be alert and look after yourself in unknown lands. Its absolutely gorgeous and I would definitely recommend to give this city a chance to charm you and spend some good time in your itinerary for the same. P.S : All pictures in this blog post are original and taken my DLSR or phone. Thanks a lot Rupam for your comments!! Beautiful photos and thanks for sharing your experience..